London Grip – founded by Patricia Morris in 2007 – is a wholly independent online venue, a cultural omnibus providing intelligent reviews of current shows, events and books, well-argued articles on the widest range of topics, an exhibition space for cross-media arts and an in-house poetry magazine with its own editor. All published items are original, making their first appearance on the internet in this form. The site’s name admits to its place of origin rather than to any wish to focus only on London events. As for the Grip, it suggests our uncertainty about where to situate a cultural fulcrum. Is London, as an influential centre, a stranglehold or a supportive hand under the elbow? By way of response to this question, we make clear that a primary aim is to track down and offer exposure to outstanding creative talent, late or latent, which can’t enter or hasn’t entered the commercial market and which, without this opportunity, would remain hidden in the community. The copyright of an accepted submission is owned by its author. Submitted items must be original and intended for their first appearance on the internet. Acknowledgement by the author of an item having appeared first on London Grip at www.londongrip.co.uk should be made in any subsequent re-publication or reproduction. The posting of an item in effect grants London Grip permission for its electronic use on this website and on the UK Web Archive. 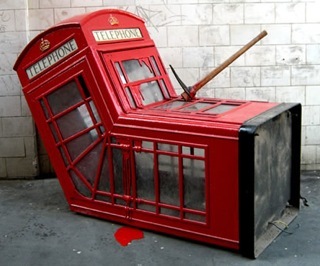 In April 2006, Banksy created a sculpture based on a crumpled red phone box with a pickaxe in its side, apparently bleeding, and placed it in a side street in Soho, London. It was later removed by Westminster Council.